Acer on Wednesday introduced its new Ultra-HD gaming monitor with an up to 144 Hz dynamic refresh rate enabled by NVIDIA’s G-Sync. The Predator XB273K is aimed at serious gamers looking for both high resolution as well as fast refresh rates. Meanwhile, the new unit is considerably cheaper than Acer’s top-of-the-range Predator X27. 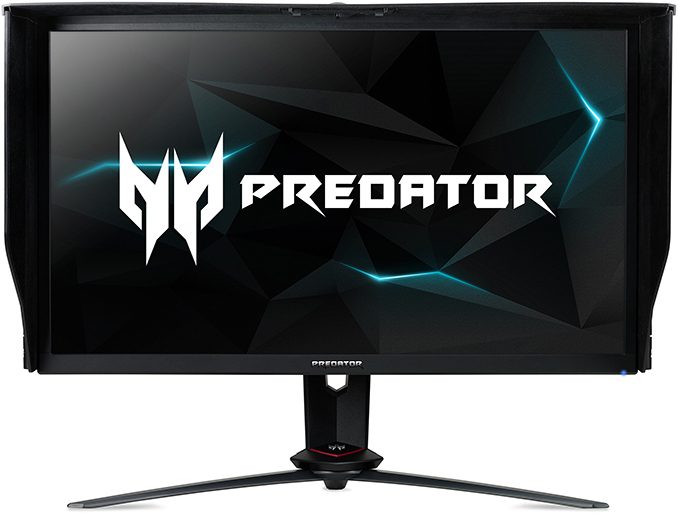 The Acer Predator XB273K is based on an IPS-type panel featuring a 4K (3840×2160) resolution, with up to 400 nits peak brightness in HDR mode (the lowest DisplayHDR certification). 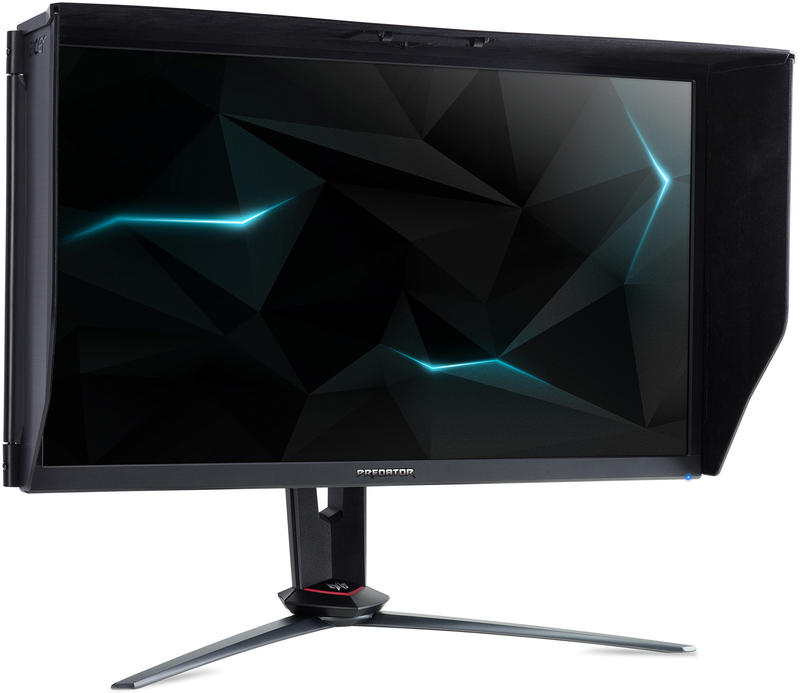 The refresh rate goes up to 144 Hz, and is dynamic via the support of Nvidia's G-Sync. The panel has wide 178°/178° horizontal/vertical viewing angles thanks to its IPS panel. 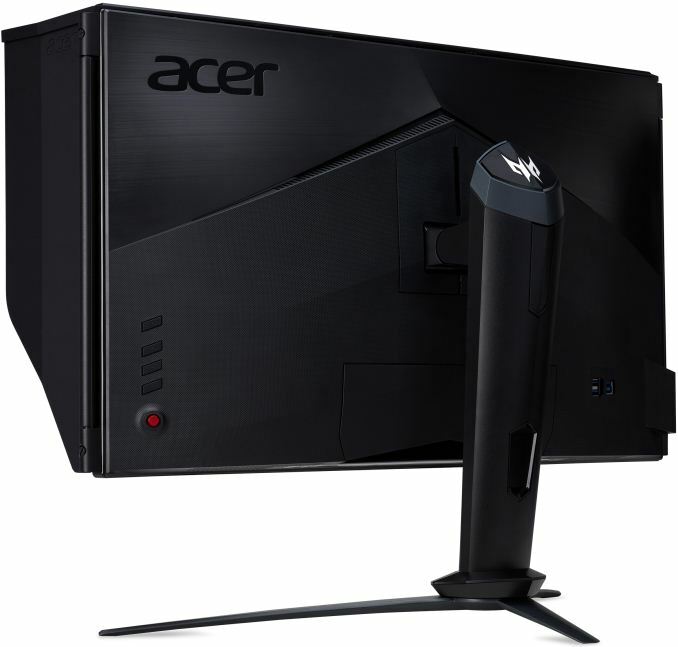 Acer yet has to disclose other specs of the LCD, but it already looks like the Predator XB273K resembles the company’s flagship Predator X27 display, but lacks FALD (Full array local dimming), quantum dot-enhanced backlighting, and NVIDIA’s G-Sync HDR. If it is indeed the case that the XB273K is based on the same AU Optronics’ M270QAN02.2 AHVA panel (Which is currently the industry’s only 4Kp144 panel), then it is reasonable to expect it to feature a 4 ms response time, along with some other peculiarities of said panel. Despite the fact that the Predator XB273K lacks quantum dots, it still supports a wider-than-sRGB color gamut. Acer says that the monitor can cover 90% of the DCI-P3 color range and naturally 100% of the sRGB palette. To further maximize color accuracy and reduce reflections, Acer’s Predator XB273K will come with a light-shielding hood, just like its more expensive Predator X27 brother. By launching the Predator XB273K, Acer makes 4Kp144 G-Sync gaming slightly more accessible. Meanwhile, it should be kept in mind that to take full advantage of such monitors, gamers are going to need an NVIDIA GeForce GTX 10-series (or newer) graphics card with a DisplayPort 1.4 output and a fresh VBIOS. Bandwidth requirements of 4Kp144 8-bit monitors exceed what DisplayPort can deliver today; therefore, to stay within the bandwidth limits of the interface, the displays will either be limited to a 120 Hz refresh rate with full 4:4:4 chroma subsampling, or use 4:2:2 subsampling to get to 144Hz+. Speaking of connectivity in general, it is natural to expect the Predator XB273K to have at least one DisplayPort 1.4 input as well as one HDMI header for compatibility. Additionally, the monitor also has a quad-port USB 3.0 hub. UPDATE 8/30: Correcting bandwidth requirements. Acer’s Predator XB273K will hit the North American market in the fourth quarter, in time for holiday season. In the U.S., the LCD will cost $1,299, whereas in Europe it is going to carry a €1,499 ($1,749 tax included) price tag. "It's not like they are tricking anyone." For this monitor, you do have a point. It is too expensive for its specs, just a 4K monitor with a higher refresh rate. Basic FALD can improve its value. What high refresh rate at 4k?